Every time I make brownies it is a fight to see who will eat the corner pieces! Usually people go for the inside of things. The inside slice of pizza, inside slice of the cake.... But this is never the case with brownies! There is just something about that crunchy chocolate that makes you put on your boxing gloves and fight until the end! There is no longer a need to keep those boxing gloves so close because Sheila g's has developed the most delicious brownie brittle! Like many brownie aficionados, Sheila is particularly fond of the crispy edges. In fact, on many an afternoon she would walk through the bakery gathering the crispy batter off the sides of the sheet pans as the brownies cooled in their racks. It had that same rich chocolate taste, but with an amazing crunch. That started her wondering: How could she create a whole pan of crunchy edges? Well, lucky for us, she figured it out! Now you too can satisfy your sweet tooth in a snap with Sheila G’s Brownie Brittle™ snacks! Sheila g's has four flavors of Brownie Brittle! Toffee Crunch, Chocolate Chip, Salted Caramel and Mint Chocolate Chip. Each is unique in their own way and so very delicious! If you were to ask me my favorite, I don't know that I could tell you just one! The Salted Caramel has the perfect amount of sweet and salty. The Toffee Crunch is chocolaty with a touch toffee. The Chocolate Chip has large chips in the brownie which add an extra smoothness to the already perfect brittle. Last be certainly not least, the Mint Chocolate Chip is minty from the moment you open the bag. The chocolate chips paired with the mind make a great relationship. I may even compare these to a famous cookie one might buy from a Girl Scout! 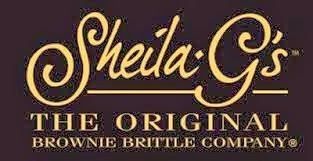 You can buy Sheila g's at many different retailers across America or have your brownie brittle shipped to your door! Check out Sheila g's Brownie Brittle on their website and on social media! A special thank you to Sheila g's for giving Sweet Cheeks and Savings this opportunity to work with them. We received these items free of charge from Sheila g's. No monetary compensation was received or offered, nor were we under any obligation to write about this product. All opinions expressed are honest thoughts. We were not offering any sales or taking orders for this item. We will not receive any compensation in connection with any sales of this item. Hum-I'd better go look for them if you say they remind you of those Girl Scout cookies which I am addicted to but which we can only get once a year!! Toffee Crunch sounds simply delicious! Actually, I want them all. However, I would be very stingy and keep them hidden so I could eat every brownie for myself lol. Yes please!! I would literally sit there and eat the entire bag in one sitting!! Ok so brownie brittle sounds delicious! I could totally go for some now! I would love to try this, I can not remember the last time I had brittle or brownies. Combining them would be great I bet. Brownie brittle sounds yummy. I will have to check out Sheila G's. Sounds like a really cool gift for a few people on my Christmast list. I have heard nothing but good reviews about this brittle. I really want to try it! My mouth is watering now. Thanks for sharing. I have had this Brownie Brittle before and it is delicious! Great thinking by Sheila G.
i love peanut brittle. i love brownies... these sound great. I love, love, love brownie brittle! My favorite is the toffee! I am buying some for the holidays! and putting them in my candy dish! How smart to come up with this idea!! I would love to try it. What a brilliant idea! I need to try this!! Salted caramel sounds like something I need to try. Delicious! Either the toffee or the mint ones would be my choice! I sure like the twist on brownies with these! Brownie brittle sounds delicious. I love the taste of brownies and never knew that there were so many flavor variations of it. These are great for holiday dinners. There can never be anything wrong with brownies involved. Brownies can never go wrong. Wow, I would love to try these out. I love brownies!